HiTi P510S is a compact all-in-one photo printer utilizing a graphic user interface on a 3.6" screen with built in media card readers and a 6-inch roll-type printer for producing 4x6", 5x7", 6x8" and 6x9" prints in seconds, perfect for events and use in photo-booths. HiTi P510S runs with low operational cost that can quickly turn your investment into valuable margins. By adding an all-new OEE II image processor, HiTi is leading the industry in providing 10-bit deep color performance and unparalleled RGB-Level. The exclusive HiTi Color technology and 10-bit Color Engine create vibrant colors as well as natural and continuous tones, offering both professionals and amateurs the best color output quality. Designed as an easily movable roll-type printer and weighing only 30 lbs, the P510S brings the flexibility to do on-location photo finishing. Utilizing a graphic user interface on a 3.6-inch LCD, it is veryeasy to operate HiTi P510S printer without the need of a computer.With less clicks and intuitive user-interface design, printing a photocan be a much easier and faster experience. HiTi P510S enables business owners freely to add customized photo- e-frame from the backstage system to provide value-added holiday or event prints for customers. With a built-in storage device, P510S is able to store several photo e-frame and ID formats to satisfy varied printing needs. Through an USB cable, HiTi P510S can be connected to HiTi P510K Mini Photo Kiosk and as its slave printer. This function can be enabled simply by setting up the backstage system, and users are able to print photo in various sizes without constantly changing the consumables. Extending your photo printing business more flexible and comprehensive is powered by the solution. HiTi P510S offers users the versatility to print various photo sizes, including 4”x6, 4”x6:-2UP, 5”x7, 5”x7:-2UP, 6x8, 6”x9, and 6”x9-2UP.There is also a 2UP function available for 4"x6", 5"x7" and 6"x9" prints from the printer driver on PCs and notebooks. The exclusive HiTi Color technology and 10-bit Color Engine create vibrant colors as well as natural and continuous tones, offering both professionals and amateurs the best color output quality. The front loading design of the HiTi P510S printer allows for easyaccess to the ribbon and paper roll resulting in easy and efficientmaintenance procedures. P510S provides varied professional image software for all your businessneeds, making good use of passport/ID photos and e-frame photo printing. 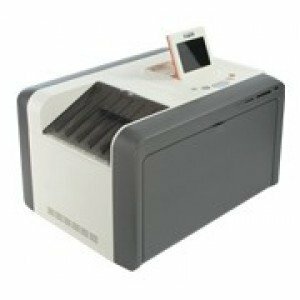 HiTi P510S photo printer delivers industry-leading performance and consumes less power. The total power consumption of HiTi P510S is about 300W, and less than 20W as printer is idling.